Spend less time on documents and more time managing customer relationships with PrizmDoc for Sugar. View any document on any device right in the browser — no downloading required. 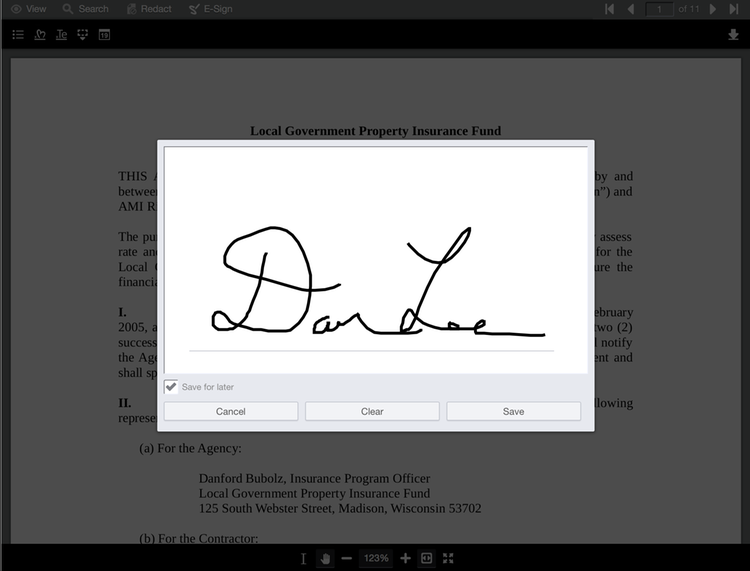 Unlimited document signatures from within the web browser to streamline your sales process. Auto-redact sensitive client information to ensure protection of privacy. Redactions are burned into the PDF output as a new document version. Save your document with redactions and signatures as a new document version into Sugar without navigating out of the application. Perform advanced searches within documents by word, phrase, date, or any other search query. Speed up your business processes by viewing any document on any device within Sugar instead of navigating to other applications or downloading. Our HTML viewer allows you to display dozens of document and image file types within your browser including Word, Excel, PowerPoint, PDF, OpenOffice, AutoCAD, JPG, PNG, TIFF, GIF, DICOM, and more. Are you paying expensive license fees just so that your team can simply view documents such as AutoCAD files even though they will never need to edit them? Our solution removes that need as every file type can be viewed in Sugar using only your browser. No additional, pricey licenses needed. Quickly sign, redact, and search documents all from a single point of access - your Sugar CRM. PrizmDoc for Sugar streamlines business document handling to make project, sales, and proposal processes smoother. With PrizmDoc for Sugar, there is no more downloading or navigating out of Sugar to view, sign or share documents. Keep your users and files in Sugar where all parties can quickly view the same document version. PrizmDoc for Sugar easily integrates into your Sugar application, maintaining document viability without dependency on updating applications. Continual product upgrades mean less IT and admin time spent updating your applications. PrizmDoc for Sugar module support Sugar version 6 and 7.